Brad Barber Explores American Diversity in "States of America"
Brad Barber’s States of America series explores how one becomes “from” somewhere and expands the definition of what it means to be an American. Photo by Brad Slade. What makes a place home? At what point are you “from” somewhere? 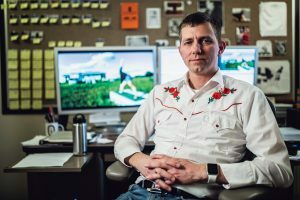 These questions propelled media arts professor Brad A. K. Barber (BA ’01) to scour the country for answers. In his documentary series States of America, he highlights one person from each state in a lyrical, five-minute episode and posts a new episode every month. In his 10 years working on the project, Barber has found that a sense of belonging means something different to each person. “It’s hard for anyone to really grasp just how vastly diverse a nation of 300 million people is,” says Barber. For one couple in Missouri, home has come one nail and two-by-four at a time. They live in a half-completed home in the middle of green Midwest farmland. “It makes you belong somewhere to build a house,” says Sarah Smith. An awkward teenager from Preston, Idaho, is making a splash in the film world. The goal of Ryan Little, director of Saints and Soldiers, is to be known as "the nicest director in Hollywood." Artists capture the essence of American identity in a diverse exhibit of historical scenes.